Who was Geronimo and why was this Native Indian chief famous? Summary: Geronimo (1829-1909) was a famous chief and and Shaman of the Chiricahua Apache who fought against Mexico and the United States during the Apache Wars. The conflicts were over the settlers expansion into Apache tribal lands. Geronimo was captured in 1886 and confined to a reservation. He died on February 17, 1909. 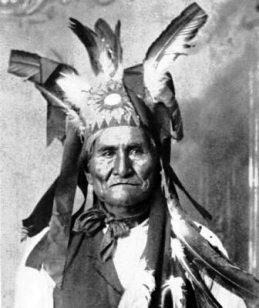 The following fact sheet contains interesting facts, background history and information about the life of Geronimo and the events in history that led to his fame as a great Native American Indian leader. Geronimo was one of the leaders which helped lead the Apache Indian tribes into battles against the foreigners who were taking their land. Among these foreigners were the Americans, Spaniards, and the Mexicans. Geronimo was born in June of the year 1829 and lived in the canyon of No-Dohyon. Again, he was one of the leaders that continued resisting the power of the Americans. He was part of the smaller tribe of the Apache Indian Tribe known as Bedonkohe. This small tribe had more trouble compared to the bigger branches of the tribe as they were also surrounded by other enemies, namely the Navajo and the Comanches. Legends tell that Geronimo was heralded as strong even when he was a child. In fact, in order to receive continued protection throughout his life as an Indian and as a hunter, he ate the heart of the first kill he ever had. In 1846 Geronimo was admitted to Council of the Warriors. 1852 Geronimo led other Apache leaders and warriors into Mexico for revenge. They succeeded in killing many Mexican soldiers during their attacks. Whilst in his twenties Geronimo had led several raids against neighboring tribes and foreigners, particularly the Mexicans. The Mexican government placed a bounty of $25 on his head. Cochise was the war chief the Chiricahua Apache. Geronimo joined in every war that Cochise participated in and also joined the raids of the Mimbrenos of Mangas Coloradas. Cochise led the Chiricahua Wars (1860–1886). Towards the end of Chochise’s life, he finally insisted on peace between the Indian tribes and the Americans that led him to accept a settlement provided to them by the government. In 1872 the Apaches were moved to Apache Pass, a reservation in the mountains. Geronimo was against the Peace Treaty due to his strong distrust of the white men but he complied with the agreement made by the war chief Cochise. Cochise died in 1874 and by 1876 the Chiricahua's reservation was terminated and the people were forced to move. Geronimo became war chief and continued his fights with the white settlers. As a war leader he produced such fear in his Mexican enemies that, when Goyathlay led the attack, the Mexicans would call out the name of their patron Saint Jerome and his nickname, Geronimo, added to his legend. Before long the name 'Geronimo' was use as a battle cry. During this period, referred to as Geronimo's War (1881–1886) almost a quarter of the American troops – 5,000 – were looking for him in order to capture him. On April 21, 1877, John P. Clum, an Indian agent, entrapped Geronimo at Ojo Caliente. This was the first, and the only time in Geronimo's life that he was captured. He was sent to the Apache reservation. He hated life on the reservation and, on April 4, 1878, Geronimo led a breakout from San Carlos Reservation. He returned voluntarily but then led a second breakout on May 17, 1885. General George Crook pursued Geronimo relentlessly, and on September 23, 1887 the aging, powerful warrior chief surrendered -- only to change his mind a few days later and flee into Mexico. Finally on September 4, 1887, Geronimo surrendered to General Nelson Miles and with many of his warriors and their families. Many were imprisoned in Florida and Alabama. Geronimo never returned to his home in Arizona. In 1894 the Apaches were moved to the Indian reservation near Fort Sill in Oklahoma. His surrender ended the many years of conflict with the settlers, which had lasted from 1857 - 1886. He spent his last years dictating his autobiography and occasionally visiting fairs and other public exhibitions such as the the Omaha and Buffalo Expositions. He even appeared at the St. Louis Exposition with the "Wild West Show" and his fame led to an audience with then American president Theodore Roosevelt. Geronimo died of pneumonia on February 17, 1909. According to reports, upon his deathbed, he aired out his only regret was that he hoped to have continued to fight until he was the last man standing. So ended the life of the last of the great Apache war chiefs. The Apache Wars were a series of conflicts fought over 50 years (1851 - 1900) with American settlers and the US army against many Apache tribes in the southwestern United States. The Apache tribes involved in the conflicts included the Chiricahua, Jicarilla, Mescalero, Lipan, Chihenne or Warm Springs Apaches. The famous leaders of the Apache Wars were Geronimo, Cochise, Chatto, Victorio and Juh.